AlisonRose had the most liked content! Roleplaying, Character Design, Writing, Ponies, MLP:FiM, Cheerilee, The Apple Family. Silver's time with Valen was quickly cut short by the arrival of one of her other super close friends. Diamond Tiara. "Oh there you are!" Silver exclaimed as she embraced her friend. "Where did you go after third period? You seemed to have vanished." Silver was in fact worried for her friend, she hadn't been seeming all that well recently. Was it something she ate? Was it the weather? Oh well, that was a topic for another time. Now that school was out for an extended weekend Silver thought it would be a good time to simply throw all worry to the wind and just enjoy it. Plus they were about to go on a MASSIVE sleepover! Silver glanced out at a few of the other fillies and colts as she had a tingle in her mind that someone was thinking about her. Her eyes locked onto Bebop, something about her seemed different. Being the 'reformed' Silver Spoon that she was, and come now she wasn't that bad to begin with just...'misunderstood' and 'a lacky', she waved to Bebop and offered a large grin. Rarity had plans today, plans that she had been looking forward to all week. 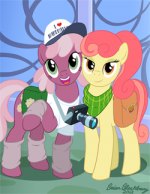 It was time for her to travel to the mall with one of her best friends, Applejack. The two hadn’t gotten to spend too much time together but today was going to be the start to a change to all that. Rarity had things all planned out, she was going to take Applejack to get some new clothes. It was just the start to the day so Rarity didn’t want to do anything too crazy. She waited outside the mall wearing her normal after school attire, a white blouse with a blue skirt, a fashion belt across her waist and some knee high stockings, instead of her boots today she wore some simple sneakers that were a light blue. The weather hadn’t been that bad recently but she still brought her rain coat and umbrella just in case, a girl could never be too prepared! Rarity checked her phone, still no text or call from Applejack, could she have forgotten about their meeting today? With a soft sigh Rarity stepped inside of the mall, the wind had been picking up a bit and not wanting to put her jacket on just to take it back off she thought it would be the wisest choice. Her backpack was rather heavy today as she had a bit of homework to work on, some of which she was going to ask Applejack to help her with. 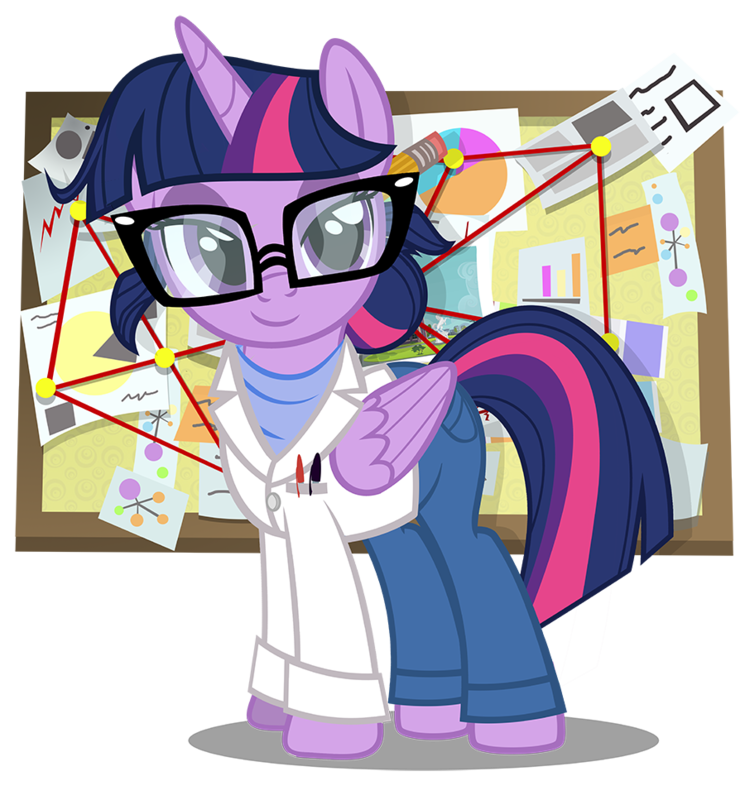 While Rarity herself excelled at Math she often found herself lacking when it came to the science part of the class work. “Hey Applejack, chores keeping you a bit extra today? 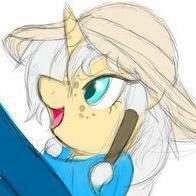 Want me to swing by the farm and help?” She sent a quick text to Applejack. Normally she was against getting herself dirty right before a mall day but if it was for someone like Applejack she would throw that to the wind. She’d still fuss of course but she’d deal. Rarity was very pleased with the way that Valen was acting. Her tone had taken a bit of an 'Evil Mastermind' trill to it but that was something she quickly corrected with a giggle. She had figured that Valen would have given her the kiss on the cheek without the need of the enchantments but she felt it was a rather harmless way to 'demonstrate.' "Well next, this is a rather feminine set." She began to place the pieces upon him. She was very careful about its positioning and the way it flowed on his body. Granted it was very much too large for him, but that was easily fixed later. The poor colt was practically swimming in the summer dress. The necklace sat on him like a collar and the hat just about the right size. "Hmm, it seems my measurements for this set were way off." She tapped her hoof on her chin a few times. "Mayhaps we need to get Twilight to help with this one." Rarity had worked with Twilight a few times before when it came to outfits and enchantments, no one knew them better than Twilight that was for sure. Together the two had made some very very interesting items. The other option that came to Rarity's mind was to call Coco to see if she was still in town and have her help with the stitching or even just to rebuild the outfit from scratch. "What do you think Valen? Is it at least comfortable?" Rarity's motherly instinct was kicking in a bit as she adjusted the hat upon his head and brushed his mane from his face. He really was a close friend to her and she sometimes had to remind herself that he in fact didn't belong to her despite her thinking and sometimes wanting it to be that way. "Or would you rather me call Silver to come help." She let out a soft giggle, Rarity knew he would be opposed to that idea. That is the last thing she wanted to do to him was give her more 'black mail' material. Even though part of this whole process was her idea Rarity had been lead to believe that Valen himself wanted and asked for this. The first thing Rarity noticed of the chaos noodle was that he was wearing the tie she had made for him. "Well hello Discord." Rarity started looking up at him with a grin. "Ah yes, Rainbow Dash said she had to get the 'morning storm' out of the way and 'couldn't change the weather just for me' but its fine, I quite like the sound the rain makes as it hits the windows while I work." Rarity let out a soft sigh and closed her eyes as she listened for a moment. She had been thinking about this morning all day, what would they do, where would they go, was there going to be a huge crowed taking pictures of them making tabloids about them? Either way she was going to push all thoughts to the back of her head and let this morning play out as it willed itself to. "Had you thought about what you wanted to happen this morning?" She peaked her eyebrows at him, surely he was the avatar of chaos, he had thought about several things happening but Rarity was only interested in where he had thought this pre-date would go. Rarity without question got up and began to follow Fluttershy. She was rather happy in this setting. A nice relaxing evening with one of her friends was always a good way to end the day. "And you look gorgeous yourself too darling." Rarity replied, a grin on her face as she took a barrette from her bag and pinned one of her curls out of her face. It had been quite troublesome recently and frankly she was tired of flipping it from her face. "I'm glad you have plans," Rarity let out a soft giggle, "when it came to this I really had no idea what to do. I was thinking of nature walks, animal watching, maybe even having a giant bubble bath with otters." Rarity trailed on listing more and more ideas about Fluttershy and animals while she let Fluttershy walk them somewhere. Coming back to reality Rarity looked around as she almost bumped square into the backside of her date. "I'm sure that whatever it is we are doing together it will make for a great evening." Rarity, in this very moment, was aglow with joy and happiness. She knew Twilight would keep herself objective, she couldn't risk letting emotions getting in the way of the future and safety of not only her friends, but Ponyville, and even Equestria as a whole. "Well my dear, its been some time now." Rarity began, tapping a hoof on her chin as she thought back to when she knew it in her heart that she had such feelings for Twilight. "It must have been around the time of your birthday, when I made you that dress. Even though I felt that it was the worst thing I had ever created in my existence you still loved it and wore it with pride because I made it for you. That meant so much to me, I could feel it deep down inside that something was stirring. Since then its only gotten louder." Rarity let out a soft laugh as she pondered the next question. Did anyone else know? "Well, if anyone else knows about how I feel it'd be Valen and Snowball. Two friends that actually helped me work up the courage to even tell you all this." She nodded her head before fixing her mane. "What do I see us doing? I can see us helping to expand the business and trade of not only Ponyville but perhaps of all of Equestria. With out travels and friends that we've made who all have so many wonderful things to trade it'd be a shame to not help them in some way. Aside from that the options and opportunities are limitless. I feel that together there isn't much that we can't do. If we need more help we can always call on the rest of our friends from far and wide." Rarity took a small pause, she had to remember that she was talking to the Princess of Friendship, not just her friend and love interest. She had thought that business had been too big of a point that she was trying to hammer home as that was only one of the many things she could offer. "I could also lend my aide in that department. One of my pen-pals that I have been keeping recently is actually a Caribou from the clan Askr, a Seer to be exact. Her name is Eir Cliudottir. We've only written back and forth a few times but I get the feeling that she wants to better the world anyway she can." Rarity frilled her brow a bit. Had she spoken too much? Was she not being courteous enough towards her friend? Rarity still had a sparkle in her eye even when she talked business and the like with Twilight, she wasn't going to let on but whenever her and Twilight conversed it was always made much more interesting. Silver had been kind of zoning out with everyone gathering about. "Why hello Scootaloo, I'm surprised to see Sweetie Belle not here yet." She looked about quizzically, Diamond Tiara wasn't here either now that she thought about it. This was going to be a rather fun night regardless, there was going to be snacks, drinks, camping out under the stars! Silver blushed as she let out a soft sigh looking towards the sky. She really did love looking at the stars at night, it always felt so romantic. She was excited to get to know a few of these out of town ponies that Apple Bloom somehow knew, perhaps it was from her out of town travels with the Cutie Mark Crusaders or even when they left for the Equestria Games. She took stock of everypony that was around making mental notes about each one so that she would be able to place name with face and the like. She wasn't always very social but tonight she felt like breaking that chain, maybe only a little though. Can't get too wild. She walked over and threw a hoof over her coltfriend Valen. "What about you Valen, excited for tonight?" She asked Valen giving him a rather large grin. Rarity giggled loudly. She couldn't help it when she was with Saffron. She always had this relaxed, simple, but funny aura about her. "You did use it correctly my dear." Rarity said with a large grin on her face, it was nice to see someone other than herself taking interest in the fine arts of linguistics. "Oh my, that does seem really clever and handy!" Rarity said taking a closer inspection on the apparatus on her friend Saffron. "Congratulations on opening your new store!" Rarity was genuinely happy to hear that many more stores and places were opening up in Ponyville and the surrounding area. Meant that she didn't have to fight so hard to get the things she needed for her outfits and enchantments. Her stomach rumbled again, this time a bit more audible. She knew that skipping dinner last night and breakfast this morning was a horrible idea but fashion shows didn't have to stop and eat so why should she. Luckily for now she wasn't working on a fashion show set, merely fitting a very close friend into them for the show. "Well, how about we go inside and maybe try some of your soup? Or would you rather I take you to see something special first." Rarity grinned largely as she waved her hoof about showing off the new store-front to the Boutique. It had an all new front, complete with new mannequins and attire. Rarity looked at the photos in wonder, it was very interesting that Blueblood would be interested in someone like this. "Well I can say she is very pretty, and well toned for sure." Rarity nodded her head pushing the photos back towards Blueblood. Well, if that was the kind of pony he was interested in than it didn't really bother her that she wasn't 'his type.' She giggled softly to herself with that. "I'm glad to see that you and a few others are working together to solve the problem." She was quite interested in this since she had been pen pals with one of these Caribou, but that was a story for another time that wasn't just breakfast and talking. "If you need any assistance from me you know how to get a hold of me." Rarity flipped her mane from her face. It really was nice to see that Blueblood was doing well and doing good things with his power and wealth. Rarity started to fumble with her hooves a bit, she was honestly nervous about all this now. She knew that Blueblood wouldn't be the one that she takes to her special trip, but to know that he had so easily moved on beyond her and found a mare, a guard mare, to be with was something that she never thought would have been possible. Having been around him this time was for sure a much better experience than it was previous. "Well, it was great to catch back up with you Blueblood." Rarity looked outside seeing that it was almost time for her to get back to work. "But alas, I have to get back to the boutique, I have a few clients that I'm meeting with for a fashion show in Canterlot in two weeks." She let out a sigh, she didn't like talking about actual work with ponies but rather the products. "Thank you for your time Blueblood. Maybe we can do this again sometime soon. Oh and if you would like I can get you and your mare friend tickets to the show. I'll be showing off Dust N Debris and his new attire." Rarity bowed her head to him as she waved down Snowball to get the bill. Rarity had a huge grin on her face as Blueblood agreed to do this again another time. Then came the talk of her new and improved operations including Rarity For You and the Rarity Express. It was true that she was working rather hard on her business fronts and accepted nothing less than perfect from anything that was sold under her name. "Well my plan was to help Coco get a name for herself so if I have to go off and attempt to save Equestria with the others again there wouldn't be an interruption in services. So far she has done an amazing job running the stores in Manehatten. I just wish she would take more credit for them and actually let me put her name next to mine." Rarity let out a soft sigh, Coco was too modest when it came to gratitude. "You might not know this but in an upcoming movie Coco is actually slated to be the lead costume designer and will get to design dresses for some very famous ponies, including Rara." Rarity was beyond excited for this. "I hear that you met Rubble Rose. Or that she happened across you." Rarity let out a giggle. She had heard all about the 'curse' that Rubble had. "I've been working on a new line of fashion for her. Some that doesn't lose its shape or get completely destroyed when she sneezes." Rarity had an idea in her head that Blueblood was more interested in Rubble's kind than her own but wasn't going to let the cat out of the bag just yet. "She is a pretty interesting case, but at least now I know two gender swapping ponies." She giggled a bit louder this time. Now was the perfect time to talk about her gender-bending work she had done for Rubble, or even to talk about her young model Valen, Gilded Lilly, who simply cross dressed for the moment. "But tell me Blueblood, other than this gender-swapping. Whats going on in your life recently, since we haven't really talked about you much on this date." Rarity smiled as politely as possible. Snowball came back with a refill on their coffees. "Can I get you two anything else?" Snowball was clearly still confused about Blueblood but was trying to play it off cool. The store was getting rather busy now but luckily the two still had almost half the cafe to themselves. "Oh, I would like just a single serving of your Rose Petal Tea please." Rarity asked very politely. Nothing cleaned the pallet as good as a nice relaxing mix of herbs, honey, tea leaves, and rose petals. "And for you?" Snowball asked towards Blueblood, trying to be the best hostess ever. "Well you have for sure already shown me a much better time than the last few." She nodded in agreement. What he had said about being both and understanding was a bit confusing but Rarity didn't put much thought into it. She had started on her short cake before the comment of not being his type came across the table. Rarity's jaw hung a bit, the cake just a few moments from entering her mouth as she just sat there in shock unable to move. Not HIS type? Then what is HIS type? I am Rarity, I am everyone's type! She thought to herself. Even among other mares and even some stallions in Canterlot Rarity was a cut above the rest, not to mention around Ponyville. Rarity did all she could to help everypony reach their highest level of beauty, both physical and other. "No, this date wasn't per say to find a future partner. But if one had presented itself I wasn't going to say no. I appreciate you being so forward about it." Rarity finally able to move took that bite of cake she had on her fork and was once again at peace. The cakes that she had gotten from here were second only to the Sugar Cube Corner. Rarity was sure that Snowball had some sort of baking magic that she either learned or stolen from Pinkie Pie. It had to be. "As you most likely read in the missive I sent out these preliminary dates were not only used for meeting new ponies and catching up with old ones, but its also a way for me to find a partner to take with me for this fancy weekend event that I won tickets to. All expenses paid trip to an unknown city and tickets to an event there for two. But the only catch is that I have to take someone with me." Rarity brushed her mane from her face as she looked at Blueblood deep in the eyes. "No this doesn't mean that I am just using you, or these dates. In all honesty I am having a great time catching up with you and spending time with you. Even if you don't want the position I'd say this date was a success for you. I wouldn't mind a few more future friend-dates if Bluebelle would take hoof to it." Rarity really was enjoying herself. Granted she was still a bit urked at the way he simply brushed her off as not his type but that was to be expected sometimes. Rarity let out a soft sigh as she sipped a bit more on her now cooled down coffee "Forgive me, I have been a horrible date. Are you enjoying yourself?" She asked, the first time this date that she actually worried if she had done the same thing to Blueblood that he had done to her before. Rarity laughed a bit when Twilight said she got dirty all the time. It was something that she knew wasn't true to that extent. Most commonly it was Rainbow Dash and Applejack that were busy getting themselves all dirtied up and in need of a spa day. Rarity thought that the meeting had been going very well up to this point. She knew deep down in her heart that this question was coming but she had hoped that it wouldn't show at all. Rarity clung to the word if as it left Twilight's lips. That meant there was a chance she wouldn't have to and if that was the case then she'd be fine with it. "Well as you fully know, I would much rather not have to cut ties with any of my business or stop being THE greatest fashion designer in all of Equestria. But if it was for you or to help Equestria in some way I would." Rarity shook a bit as the words left her mouth. She knew that it would be very hard for her but if it meant being an invaluable tool to Twilight and Equestria as a whole then she knew what had to be done. "Besides, I have a few close friends who I could entrust the business to." The first coming to mind was none other then Coco Pommel, someone that Rarity held in a very high regard when it came to fashion and the like. "I might have achieved much of what I had wanted to in my career as a fashionista but what it comes down to it sweetheart fashion isn't just about sales and marketing. Its about not just looking good but feeling good and feeling comfortable with who you are. That is the biggest key." She nodded her head a few times as she spoke. "I am pretty good at multi-tasking if I do say so myself though. Being by your side for all this time and even expanding my business ventures and finding time for creating all these custom designs. I could stand to move some, if not all, to the back burner." She did a hoof motion as if she was pushing a box into the back of a closet. Rarity kept looking at Twilight in the eyes and trying hard not to blush as she thought about other things than business. It was true that she could tell that Twilight wasn't completely sold on the idea but that is what the note cards were for. With a quick flick thru of them Rarity found just the one she was looking for. "I would also like to say that you should never feel like you are the reason I have to leave anything behind or that I don't achieve more. I am doing this for you sweetheart, well you and whatever higher powers we are working for. But I want you to know full well that I meant what I said at the start of this Twilight, I'd bring down the stars if you asked that of me." Rarity knew she was coming off a bit forceful now but she felt it needed to be said. She let out a quick sigh as she regained her normal statute of manner. 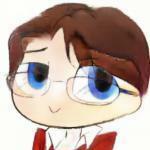 "Sorry if that felt rather pushy. I just feel very strongly about this and want you to make the best choice you can. Even if it isn't me." She flipped part of her mane from her face as she began to look at Twilight, ready for more questions.